Books to Film: DISOBEDIENCE at The Avon. Please join us for a post-film discussion moderated by Ashley Vanderwaren. 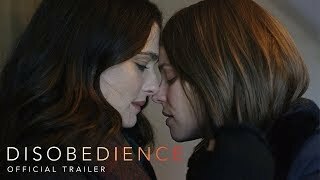 This special screening of DISOBEDIENCE is part of our Books to Film series. Each screening in the series is followed by a book group style discussion. All lovers of books, book group members, and individuals passionate about books adapted for the screen are encouraged to join us for these combined literary/film events, and to participate in a lively discussion. From Sebastián Lelio, the director of the Academy Award®-winning A FANTASTIC WOMAN, the film follows a woman as she returns to the community that shunned her decades earlier for an attraction to a childhood friend. Once back, their passions reignite as they explore the boundaries of faith and sexuality. Written by Lelio and Rebecca Lenkiewicz and based on Naomi Alderman's book, the film stars Rachel Weisz, Rachel McAdams and Alessandro Nivola.